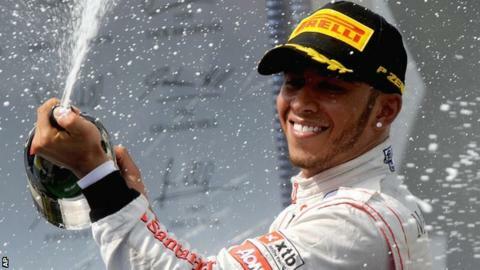 Britain's Lewis Hamilton is on the verge of leaving McLaren to drive for Mercedes next season, according to BBC F1 chief analyst Eddie Jordan. The former team boss says Hamilton will replace Michael Schumacher, who will retire from driving for a second time at the end of the year. "I believe Hamilton and Mercedes have already agreed personal terms and a deal could be imminent," Jordan said. In a statement, Mercedes said they did not comment on rumours. But they added: "Until we are in a position to confirm our full driver line-up for next season, it is inevitable that there will be speculation around this topic." McLaren issued their own statement, insisting they were still in talks with the 2008 world champion about a new contract. "We have been told by Lewis Hamilton's management team that the story is untrue," said a McLaren spokesman. "Negotiations between Lewis Hamilton and McLaren continue." Hamilton's management team, XIX Entertainment, also claim they are in "advanced discussions with McLaren about a new deal" and said Hamilton's focus was on this weekend's Italian Grand Prix at Monza. However, there has long been talk about Hamilton, 27, leaving McLaren, the team he has been with since the age of 13. His management team have already approached Red Bull and Ferrari this summer but been rebuffed. F1 boss Bernie Ecclestone suggested on Sunday that Schumacher was retiring for a second time, following his comeback in 2010. Ecclestone later conceded he did not know for certain whether the 43-year-old German would quit, while the driver himself said he had not yet made a decision about his future. But Jordan thinks the seven-time champion is on his way out and will be replaced by Hamilton. "Some weeks ago, I said on TV that I felt Lewis was on the move and I had an idea at the time he had been speaking to Ferrari, which we now know is true," Jordan said. "But I can now confirm his people have had meetings with Mercedes. "There has appeared no urgency from either Hamilton or McLaren to sort out a new contract for 2013 and at the same time there have been signs of unease in the relationship"
"Bernie Ecclestone made it clear to me live on television on Sunday that Schumacher was leaving, although Schumacher later played it down. "So it would appear Michael is leaving and Lewis is arriving at Mercedes. "Hamilton has not agreed terms with McLaren yet. In fact, the team have made it clear they cannot offer him as big a salary as his current $15m (£9.42m) deal, which was negotiated before the global financial crisis. "On top of that, McLaren have to pay for their Mercedes engines for the first time next year." Jordan said a switch to Mercedes would make a "lot of sense" for Hamilton and his manager Simon Fuller, the man behind the Spice Girls and now David Beckham. "Fuller is trying to position Hamilton as a major global star, like Beckham, and Mercedes is a much bigger global brand than McLaren," said Jordan. He also said Hamilton's signing would be a "massive coup " for Mercedes at a time when there has been some uncertainty their position in F1. If Hamilton left McLaren, it would leave the team with a huge hole to fill. Among the candidates for the vacancy alongside Jenson Button would be Scot Paul di Resta, currently at Force India, and Lotus driver Kimi Raikkonen. Di Resta, who has the same management team as Button after splitting with Hamilton's father Anthony, has continued to impress this season, his second in F1 with Force India. Raikkonen, who drove for McLaren from 2002-05, was tipped for a return to his former team in 2010 before negotiations broke down over money and team boss Martin Whitmarsh turned to Button. Raikkonen returned to F1 this season with Lotus after two unsuccessful years in world rallying and although he has had some unconvincing weekends, his performances have been increasingly impressive. BBC Sport understands Raikkonen is on course to satisfy performance clauses in his contract that would commit him to Lotus in 2013, which means any team that wanted him would have to pay Lotus compensation. The 32-year-old Finn currently lies fourth in the championship, one place ahead of Hamilton, with eight races remaining this season.